Brief Synopsis – Upon returning from fighting in the Crusades, a young nobleman tries too stop the tyrannical rule of the Sheriff of the town. My Take on it – As a fan of the Robin Hood mythology, I was looking forward to seeing this movie ever since I first saw the trailer for it a few months ago. Unfortunately, this is a really poor adaptation of the myth and it tries too hard to be innovative which turns the whole story on end. This is a story that should be much more fun and impactful than they are able to bring us here. They fail to develop the characters well enough and this causes it to be much harder to care about them or anything that happens to them especially when the story feels very superficial and has been turned into an action film instead of something with heart. I’m a big fan of Ben Mendelsohn, but he has been typecast too quickly in the role of the villain and his performance here seems like a carbon copy of the roles he played in Rogue One: A Star Wars Story (2016) and Ready Player One (2018). This film has one glaring positive point and that has to do with teh way that they depict combat in medieval times in a much more modern fashion. Things move very quickly and they make the battlefield tactics seem much more dangerous and fast paced. which makes those scenes quite exciting to watch unfold. Unfortunately, this film seems to be trying too hard to making the political aspects of the film seem analogous to modern political situations which also takes so much away from this film and any impact it could have. 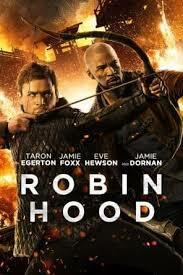 Bottom Line – Poor adaptation of the Robin Hood myth that turns the whole story on end while trying to be innovative yet instead just isn’t as fun as the story can be. The characters are not developed well enough and it’s extremely hard to care about them at all. Mendelsohn shouldn’t have been cast as the villain here, because he seems to be typecast in this kind of role too often and it now seems very unoriginal. The only enjoyable part of this film is the way that they made combat in medieval times feels as quick paced and dangerous as current battlefield tactics. The story also feels too much like they are trying to make a political statement with this film by making it analogous to the political situation and that also takes so much away from enjoying this film.